Well, that did not take very long. The standard capacity magazines ban that a Federal Judge overruled has been put back into place, again, by the very same judge; 4.2 million CA guns owners go to Facebook to complain. During our Brownells Bullet Point segment, Professor Paul refers back to Maslow’s Hierarchy of Needs. What do you do if you do not have clean water to drink? Also, we have a SOTG Homeroom from Crossbreed Holsters. Being dangerous on demand is not just about defending against two-legged predators. We have two stories in one week where animals attacked humans. 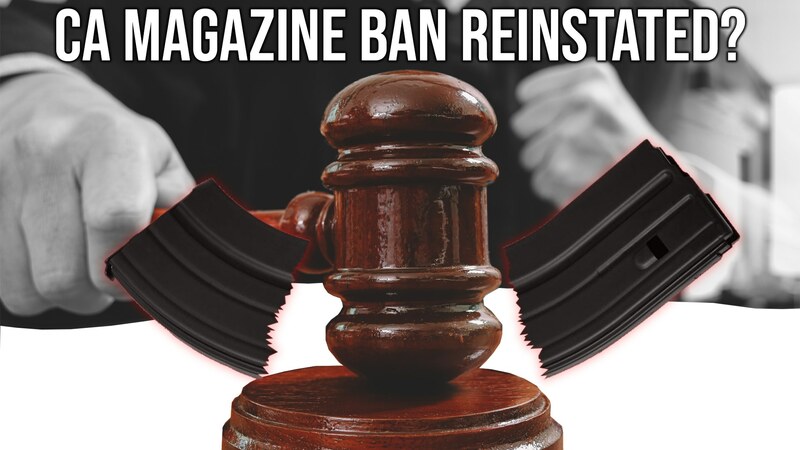 A San Diego federal judge last week knocked down a state law banning high-capacity gun magazines, but in a new ruling Thursday held that sales and manufacturing of such parts will remain against the law until the case has exhausted all appeals. U.S. District Court Judge Roger Benitez’s latest order essentially returns the situation surrounding magazines holding more than 10 bullets to the status quo that has been in place since the summer of 2017, when the judge granted a preliminary injunction. According to the terms, gun owners can’t acquire new magazines, but they aren’t barred from owning them. The state Attorney General’s Office petitioned the judge for a stay to his final decision on the lawsuit, Duncan v. Beccera, until the 9th U.S. Circuit Court of Appeal can weigh in. Numerous cases of bottled water have been discovered inside a former school in Flint, Michigan. The Flint Journal reports the water was found by two people who were inside an old school next to the former St. Agnes Church. Jimmy Cowell shared his video with the newspaper. He says he was “dumbfounded” to see water mixed with debris in the building. “We were pretty dumbfounded that anyone could leave that much water behind that this city truly relied on,” Cowell said. Vermont Fish and Wildlife officials say the coyote the attacked an Addison County couple on Monday has tested positive for rabies. Officials say Priscilla and George Gilman of Salisbury were walking on their property Monday morning when they were attacked. George retrieved a shotgun and killed the animal as the attack continued. The couple were treated at the hospital for bite wounds on their arms and legs and are also receiving rabies shots. The Vermont Health Department confirmed Wednesday that the coyote was rabid. When mom Chelsea Bromley went to check on a ruckus in the yard where her 7-year-old son Zack had gone to play Friday afternoon, she discovered a young mountain lion had pinned the boy to the ground with its jaws clamped on his arm, Global News reported. A helicopter airlifted Zack to a hospital, where he received stitches for bite wounds on his arms and head, CBC News reported.